These gorgeous plants produce showy flowers that come in a profusion of wonderful colours. 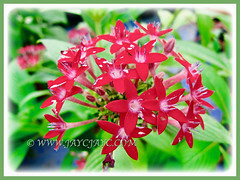 Pentas lanceolata is free-flowering and will definitely brighten every shady corner in your garden. If you’re a nature lover, do grow them to attract butterflies and hummingbirds. 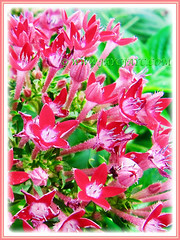 Botanical Name: Pentas lanceolata (syn. 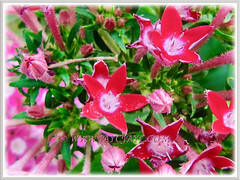 : Pentas carnea). 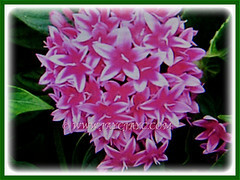 Common Names: Egyptian Star-cluster, Egyptian Star, Star Flower, Star Cluster, Pentas. 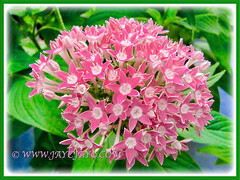 Etymology: The genus name, Pentas comes from the Greek word pentas, referring to the 5-petaled flowers that occur in this genus. The specific epithet, lanceolata, refers to the lanceolate or lance-shaped leaves. Origin: Native to Africa and Yemen. It is also cultivated worldwide. Plant type: An ornamental, herbaceous perennial sub-shrub. 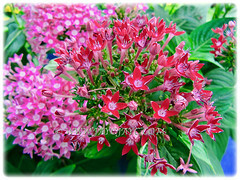 Features: Pentas lanceolata is a species of the genus, Pentas that consists of 16 accepted species of flowering plants. A favourite plant with horticulturists who have introduced many new cultivars with tones of purple and lavender and mixed blooms such as pink with red centres. A fast-growing herbaceous sub-shrub reaches up to 1.3 m in height and spread to 0.6 m wide. Its growth habit may be upright or low and mounding. The evergreen and opposite leaves, measuring 8-14 cm long, are dark green, lance-shaped, hairy and deeply veined with entire leaf margin. 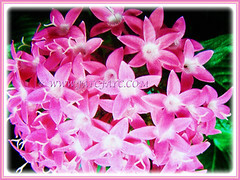 Being warm region tropical plants, they produce clusters of flowers that are held in large terminal clusters known as corymbs consisting of about 20-40 star-shaped flowers. They come in a variety of shades, namely red, white, pink, and purple. 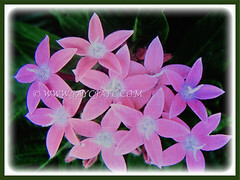 They are commonly known as Pentas because of the five-pointed petals on the flowers. These flowers will eventually be followed by dry and dehiscent seed capsules, measuring 4-5 mm in length. 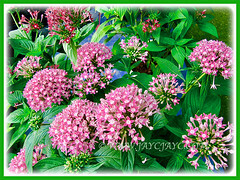 Culture (Care): Pentas lanceolata can be easily grown with minimum care. Light: Full sun to semi-shade, though flowers best and is more robust in full sun. Nonetheless, it does blossom in shade. Moisture: Moderate water requirements. Allow the soil to dry slightly before re-watering. Soil: Humus-enriched soil to retain soil moisture. Also, good in loamy and well-drained soils. 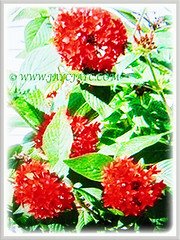 Others: Deadhead Pentas flowers to encourage more blooms. Feed once monthly with a balanced fertilizer at half-strength. Generally free from serious disease or insects. However, do watch out for aphids and spider mites. Also, whiteflies are problematic on indoor plants. Where winters are not too severe, Pentas lanceolata are grown as a perennial. They may be treated as an annual and replanted after danger of frost for long-lasting summer colours. May be grown as a greenhouse plant. Water regularly during the growing season, allowing soils to somewhat dry between waterings. Feed monthly. To overwinter, bring outdoor pots inside before frost to a bright, cool location and reduce watering. It may be grown as a houseplant in a sunny room with high humidity and no drafts. Take cuttings to propagate in spring and summer. Propagation: Easily propagated from softwood stem cuttings. It can also be propagated from seeds that will germinate in 5-12 days. Usage: Pentas lanceolata or Egyptian Starcluster with its ornamental and colourful flowers will be excellent for growing in flowerbeds and borders. Suitable for container gardening to add year-round colours to your landscape. 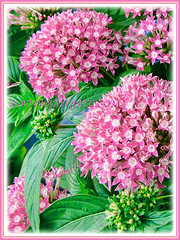 Pentas is a most welcomed magnet to attract butterflies and hummingbirds to the garden.